Thinking back to being a student, I can recall the struggle ― volume status and fluid overload. Congestive heart failure is the No. 1 cause of hospital admission in the United States, so we run into this all the time. Sometimes it is easy to determine whether or not a patient has decompensated congestive heart failure. However, I have found it quite challenging to figure out in a number of patients. Is Decompensated Congestive Heart Failure Present? Are the patient’s symptoms from heart failure, or are they pulmonary in etiology? Are the physical exam findings cardiac, or are they from other causes? Wouldn’t it be nice if this was a simple question to answer? Let's look at how we can tell if a patient is volume-overloaded from heart failure in 10 steps. Step 1. Consider history of HF, risk factors for congestive HF. Certainly, a patient with a history of congestive heart failure is more likely to be volume-overloaded from this cause than other issues, right? That is correct. This means that it’s always important to not only view the patient as if he or she has congestive HF, but also look at the most recent echocardiograms or other testing to see what the systolic and diastolic function looks like. Even if the patient does not have a history or direct evidence of congestive HF, risk factors should be considered. The American College of Cardiology/American Heart Association Heart Failure Classification categorizes patients with risk factors for HF ― i.e. hypertension, coronary artery disease, etc. ― as Stage A. If structural heart abnormalities including reduced ejection fraction or left ventricular hypertrophy already exist, patients are classified as Stage B even if they have never had definite symptoms. Step 2. Look for weight increase. Hopefully, this information will be available, as it can sometimes easily solve the problem. If the patient has gained 40 pounds in a month, it is probably fluid, and they have decompensated heart failure. Look through the chart or office visits to find the most recent weight to compare to the current. Ask the patient if they watch their weight. Attentive heart failure patients should monitor their weight and document it on a daily bases. Some other conditions can cause fluid retention and weight gain including liver failure (ascites) and renal failure. Step 3. Ask about orthopnea, paroxysmal nocturnal dyspnea. Orthopnea, the sensation of dyspnea while laying flat, occurs when fluid redistributes to the lungs from the abdomen or legs ― because when upright gravity acts to pull fluid away from the lungs. Ask what position the patient sleeps in; if on 3 to 4 pillows or up in a recliner, then be concerned that he or she has decompensated heart failure. Note that orthopnea is different than platypnea. Step 4. Examine pitting edema. Sounds simple, right? Although the presence of pitting edema may be a sign of heart failure, it is not a perfect method to determine if a patient’s symptoms are from volume overload. Venous insufficiency can also cause pitting edema and is quite common. A patient’s legs can be the size of tree trunks with skin breakdown and weeping of fluid just from venous insufficiency. 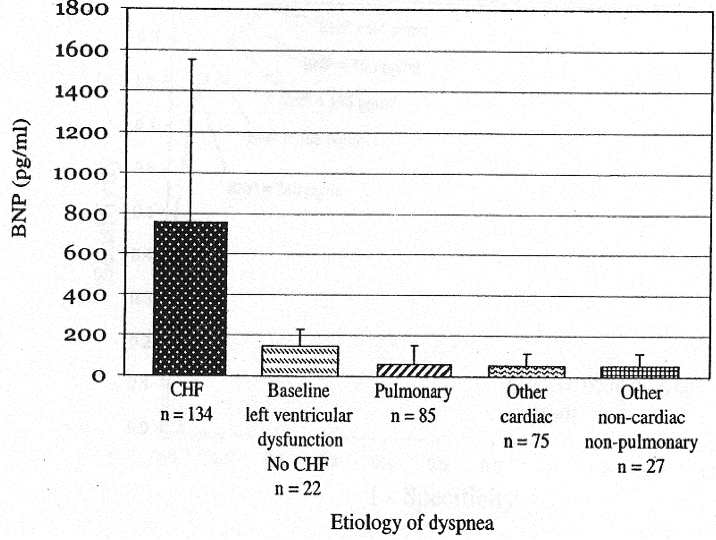 If you see that diagnosis on the chart, then don’t use pitting edema alone as a measure of volume status. But if you examined the patient 1 month ago, and you see the legs are bigger, that will work fine. Some patients with decompensated heart failure just don’t seem to retain fluid in the legs ― especially the younger patients, who may retain fluid more centrally. This means a patient can be volume-overloaded without any pitting edema at all, which is why using all these steps are important. Step 5. Observe jugular venous pressure, jugular venous distension. The jugular venous pressure is a quick way to assess volume status. When a patient is fluid-overloaded, the right heart pressures increase and transmit back to the jugular vein, causing jugular venous distention. The patient needs to be at a 45 degree angle for proper evaluation; gravity lessens JVP if upright and increases JVP if supine. Have the patient turn their head to the left, then examine the jugular vein. While jugular venous pressure waveform analysis is somewhat complex, just observe how high the pulsations go for the purpose of volume assessment. When pulsations are not visible, the patient is likely not volume-overloaded. When pulsations are visible up to the angle of the jaw, the patient certainly has elevated right heart pressures. Caveat: It is sometimes impossible to evaluate individuals with overweight or obesity for JVD. Step 6. 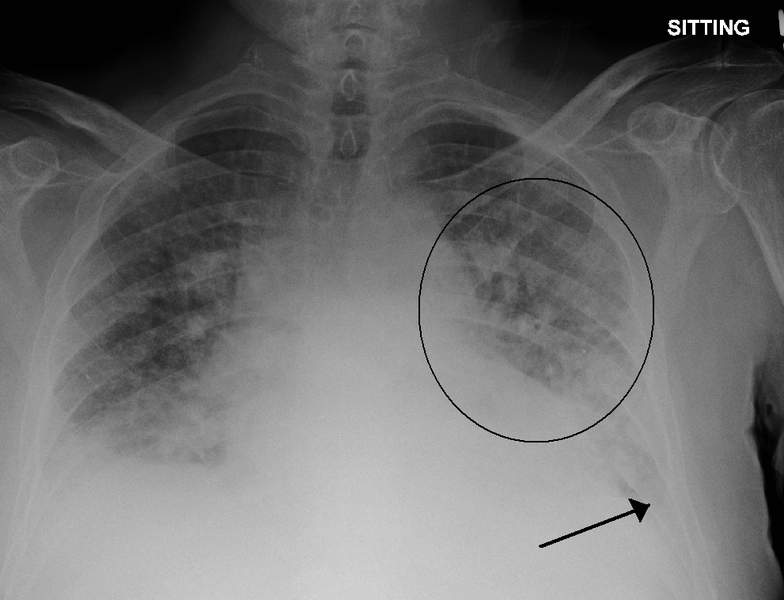 Consider chest X-ray, lung exam results. The lung exam can also offer critical information. If you hear “rales” or “crackles” on a lung exam, it may be from pulmonary edema due to decompensated heart failure. However, recall that fibrotic lung conditions can do the same. Decreased breath sounds at the base can be from pleural effusions, as well. Step 7. Look for ascites. A distended or tense abdomen can be from ascites. Certainly, right heart failure can cause hepatic congestion, resulting in increased portal pressures and accumulation of fluid in the peritoneal cavity. Ascites from HF is more likely to happen when there is severe pulmonary hypertension, severe tricuspid regurgitation or conditions such as constrictive pericarditis or restrictive cardiomyopathy. Step 8. Measure BNP, NT-pro BNP levels. This one is nice and easy. If the B-type natriuretic peptide level is greater than 800 pg/mL, then decompensated heart failure is more likely to be the cause of a patient’s dyspnea. Likewise, if the NT-pro BNP number is high, then heart failure is more likely the cause of symptoms ― although the exact cutoff for NT-pro BNP is not as clear. It is helpful to compare prior and current BNP levels to look for an increase. Likewise, clinicians frequently trend the BNP (it is a relatively inexpensive test) to monitor if the diuresis is working. Some patients have chronically-elevated BNP level, especially when systolic function is quite poor and/or when chronic kidney disease is present. The trend is even more important in these situations. Also, decompensated heart failure can definitely be present with a normal or minimally-elevated BNP, especially if the heart failure is diastolic, right-sided, valvular or from constrictive pericarditis (rare). If you want an easy, non-invasive way of measuring cardiac-filling pressures, echocardiography is the way to go. The left atrial pressure can be estimated quite accurately and, if elevated, indicates that decompensated heart failure is likely present. Diastolic assessment via echo takes some time to learn; I've summarized it here. Also, sometimes the numbers come back making no sense. A Mayo Clinic echo course I attended stressed that it is alright to say the numbers don’t make sense, “the diastolic assessment was equivocal” ― and be done with it. For this purpose of this article, just know an echocardiogram can most of the time measure the cardiac pressures and reveal if a patient is in decompensated heart failure. Step 10: Conduct hemodynamic evaluation with cardiac catheterization. This is Step 10 because it should be last resort. Invasive hemodynamic assessment does carry some risk ― i.e. bleeding, infection, etc. More than one measurement can be taken invasively to determine the cardiac pressures and learn if decompensated congestive heart failure is present. Left Ventricular End Diastolic Pressure, LVEDP: This can be measured with a catheter in the left ventricle itself. When you read reports of coronary angiograms, this number is universally measured. If this is greater than 12 mm Hg, then the pressure is high and diuresing the patient may improve symptoms of heart failure to some degree. Pulmonary Capillary Wedge Pressure, or PCWP: If this is greater than 12 mm Hg, then the left heart pressures are elevated. This can be measured via a Swan-Ganz catheter (right heart catheterization), which is nice because it requires only venous access (jugular, subclavian or femoral vein). Caveat: The dry and “cold” heart failure patient can trick you. Remember there could be symptoms from heart failure ― even when the volume status looks normal after going through the above 10 steps. I like the idea of placing patients with heart failure into one of four categories based on their volume status (wet or dry) and their cardiac output (“warm” if adequate, “cold” if very poor). This helps guide the treatment of HF, which is discussed elsewhere. The wet and “warm” heart failure patient is the most common. These individuals have a large amount of fluid in their system but a good enough cardiac output to perfuse their system; hence they feel warm. When you see a dry and “cold” heart failure patient, it is not good. Things like cardiogenic shock or severely reduced cardiac output can cause this. Feel the legs, and note they are cold (although poor circulation can cause cold legs/feet, as well). Symptoms in this setting can be from heart failure, even with a normal volume status. These are the patients in which the “cardiorenal syndrome” is frequently present ― that is, acute renal failure due to poor cardiac output decreasing renal perfusion. Diuresing the wet and “cold” patient, or giving inotropes to the dry and “cold”patient, can actually improve the renal function. To Diurese or Not to Diurese – That is the Question. The last thing you want to do is give IV Lasix to a patient who is dehydrated or give fluids to a patient who is actually volume-overloaded. Because figuring out the volume status is not always that easy, it’s critical to keep an eye out for those tricky patients described above. Don’t get me wrong. Sometimes it is quite obvious when a patient with a history of congestive heart failure comes in with increasing dyspnea, a 40-pound weight gain, pitting edema in the lower extremities, orthopnea and PND; then, you examine their jugular pressure at 45 degrees and observe it up to the angle of the jaw, rales on pulmonary exam and their BNP level is markedly elevated. But there are times when other issues can complicate the picture, making the diagnosis a bit more challenging. Hopefully it will be easier for you to figure it out now ― and make the right call for your patient!